KAZAN, Russia (AP) Taking on a French legion of stars, Australia’s back line put on an impressive collective display to shut down France’s attack in their World Cup opener. Coach Bert van Marwijk’s defensive strategy almost produced an unexpected draw against the 1998 World Cup champions, but luck was on the French side in their 2-1 victory at Kazan Arena on Saturday. France ultimately prevailed thanks to a penalty awarded following VAR review and a lucky goal from Paul Pogba. The Manchester United midfielder’s effort took a deflection off Australia fullback Aziz Behich and hit the crossbar before crossing the goal line. But he struggled to swallow referee Andres Cunha’s decision to award the French their penalty. Cunha initially waved away calls from the French players after defender Josh Risdon fouled Antoine Griezmann with a late tackle. 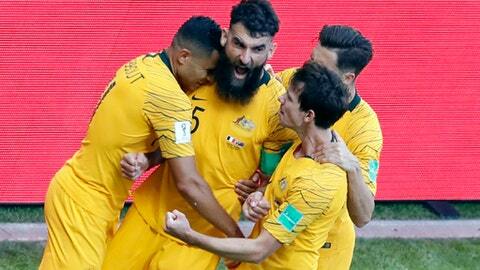 Australia will need two good results against Denmark and Peru to qualify for the knockout stage, but considering the team’s bold display, Van Marwijk has reason to believe it’s possible. Until Risdon’s foul on Griezmann, Australia’s defenders had been superb, making sure the French strikers did not get too many balls. Griezmann, Ousmane Dembele and Kylian Mbappe were largely ineffective. In the 30th minute, Risdon took the ball away from Griezmann’s foot at a crucial moment after the Atletico Madrid player brought it down with a fine control, preventing him from unleashing from close range.